Hi there! Here's another Dare to Get Dirty card to share with you. This one is for Joan's challenge. Back when I was a dirty girl, one of the monthly themes was "colors of the rainbow" and I was lucky enough to team up with her to make all the orange cards for that month.....and she's been my "orange buddy" ever since. Love ya, Joan! I had so much fun with this! The card also combines craftycaro and rsalamon's challenges. If you're a Fan Club Member on SCS, head on over to the DTGD Challenge Forum and check out the details of all the challenges. I think you have until August 1st to complete all the challenges and then you'll be entered to win a prize! Its perfect Denise, truly perfect. I love this Denise! Truly perfect! I love the idea of scoring the white cardstock and then popping the Hibiscus on top. The mini flower rhinestones are beautiful! Love it Denise!!!!!!!! I remember that month! I had yellow...I don't think I made a yellow card since! LOL! This is GORGEOUS! 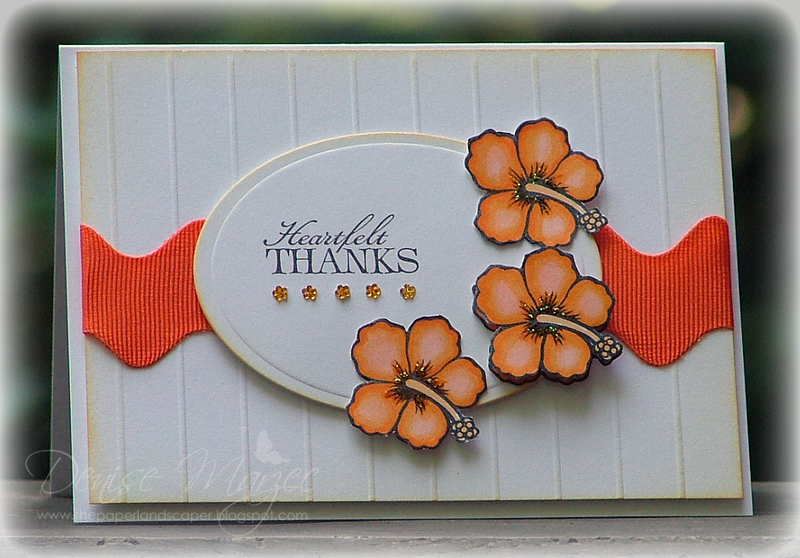 LOVE the clean layout and the stamps you used! Well wasn't that sweet of Dawn to get this stamp set for your birthday! You did a great job using it with the orange - I love that giant ric-rac!! what a great friend..This is just gorgeous. This is gorgeous, Denise! The flowers and ric rac really pop behind the simply scored background! What a beautiful cards Denise. This is so gorgeous, Denise! Love that orange!!! Denise, this is wonderful! I love the scored background and the three little flowers. Great design! Terrific card! This is stunning!! I so love your layout and the ric rac. I am so busy preparing for going away again next week I have not had a chance to play. I so want to after being inspired by your gorgeous creation!! Very pretty, Denise! I love the crisp orange and white. Beautiful design and fabulous wide ric rac. This is just beautiful, Denise! Great orange card, Denise. Love those Verve flowers and your scoring. Fun rick rack ribbon too - great card. Very pretty! Love the orange and those flowers are great! Simply FABULOUS!!! Love the scored BG and that awesome ric rac and those hibiscus are gorgeous - aren't you lucky to have such a wonderful friend!!! WOWIE!!!! This is FANTABULOUS, my little orange buddy!!!!! 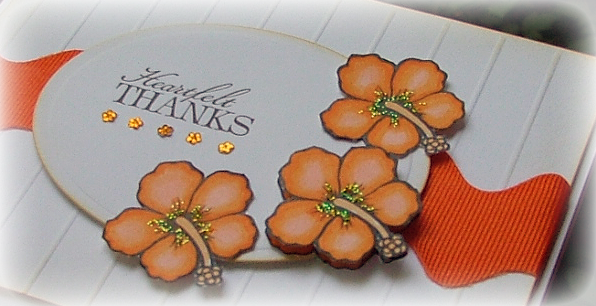 I LOOOVE your new hibiscus stamps and all the gorgeous orange....Whoohoo!!!! 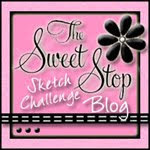 Thanks sooo much for making a sample for my challenge...it was like going back in time!!! Love ya too, gf!! !